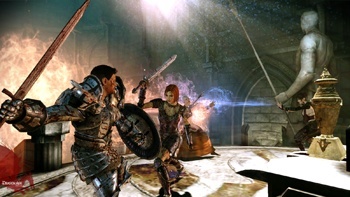 Looking forward to Dragon Age: Origins but don't want to wait until early November? BioWare will be releasing the game's character creator on October 13th, letting you get set up a full two or three weeks in advance. Via a post on the official Dragon Age forums comes this little tidbit of news: The team at BioWare managed to split off the game's character creator from the rest of it, and will be releasing it as a free download on the 13th for any and all to try out. While it'll probably be fun just to see what sort of characters you can create from the good-looking to the monstrous, this is a bit more than just free idle publicity for the game. If you create characters, you'll be able to save them to your hard drive and get to use them when the actual game releases. ...at least, if you're planning on buying the PC version. It sounds to me like everybody is welcome to download it and try it for themselves, but if you were planning on grabbing it for the Xbox 360 or the PS3, you'll just have to remake them - no handy character porting for you, I'm afraid! So, October 13th, huh? Uncharted 2, Brutal Legend, and now Dragon Age's character creator? That's looking to be a pretty awesome day.